Don't be caught unprepared when an OSHA inspection happens. 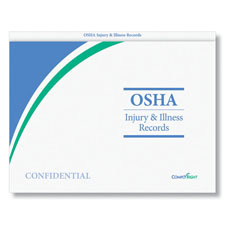 Keep your OSHA mandated safety training records organized and easy to review in an employee safety training folder. This convenient employee records folder stores emergency information, accident reports, training records, violations, specific hazardous material records, personal protective equipment requirements and more. Having each employee's safety training information organized also helps you keep track of training needs, so you won't miss a critical training deadline and risk OSHA fines.